Super friendly and curious... Berkshire pigs are a heritage breed of pig originating from the English county of Berkshire. They are small pigs with stubby snouts, short legs, upright ears and are almost entirely black, with white points on the feet, nose, and tail. 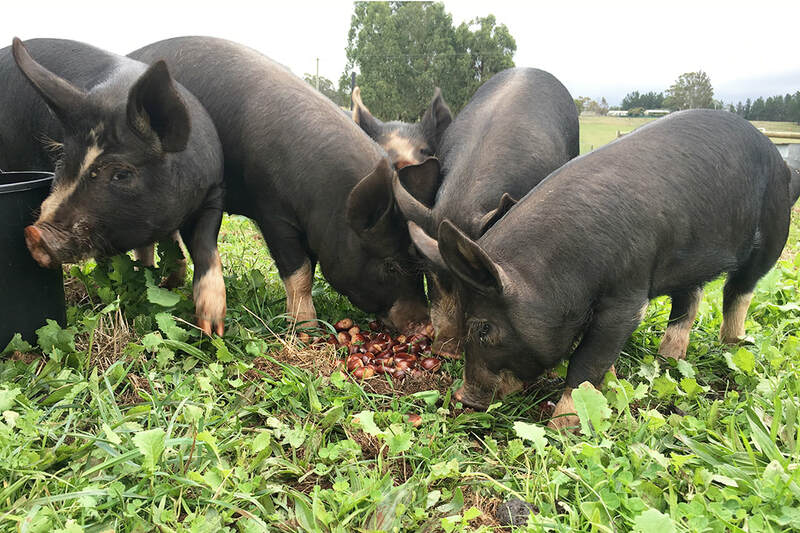 Fork it Farm pigs are raised naturally on pasture where they are free to root, graze, wallow and play. They also do a lot of snoring. We love our pigs and we love sharing their life on the farm with our followers. Fork it Farm finished pigs bring back the incredible pork flavor of yesteryear. 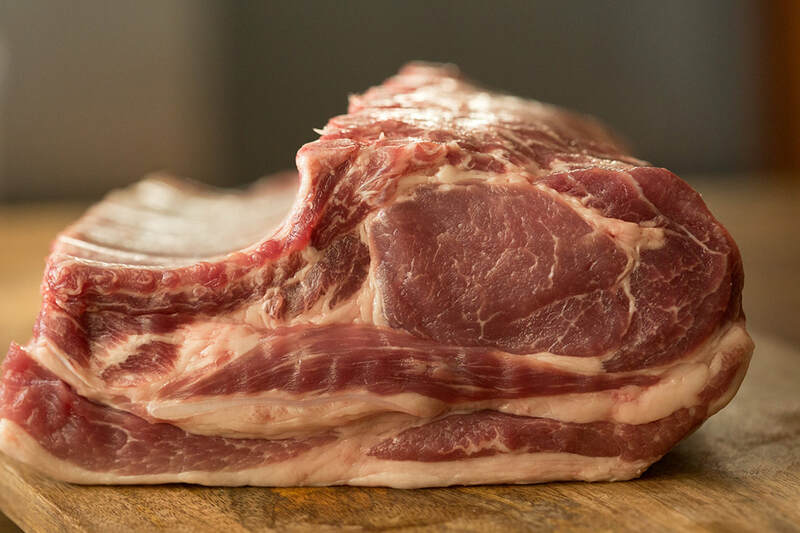 The meat is darker in colour and has a firm feel, tastes rich, sweet and has a clean aftertaste, soft fat and great marbling which makes for great flavour and juiciness. THE WAGYU OF PORK. This is what real pastured pork should taste like: no additives, no water injected, no hormones and no antibiotics, just real, natural pork. 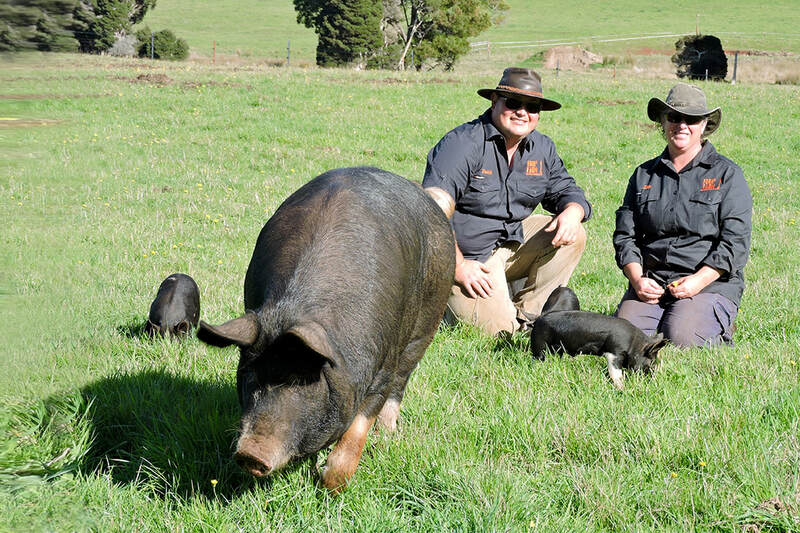 Our pigs consume a diverse, natural diet putting the tastiest, healthiest pork on your table. After saying 'fork it' to the stresses of city life, we packed up our life and moved to Lebrina, a peaceful township in Tasmania's East Tamar Valley. As avid foodies and animal welfare advocates, creating Fork it Farm has allowed us to produce and distribute nutritious, naturally grown food to our friends, family and the community. We want to share our love of farming and food with you by producing and providing forkin' tasty pork to our local community. As a member you get a monthly hog share, develop a closer connection to how your food is grown, and help give Fork it Farm the stability needed for sustainable planning. We only have a limited number of shares available, so get in quick. Sign up to receive your ethically, locally grown and forkin' tasty pork!